BIGLER — Spring is in the air and soon the smell of popcorn will be too. Cen-Clear is excited to announce the annual Child Abuse Prevention Carnival will be held in three communities in two counties this year. 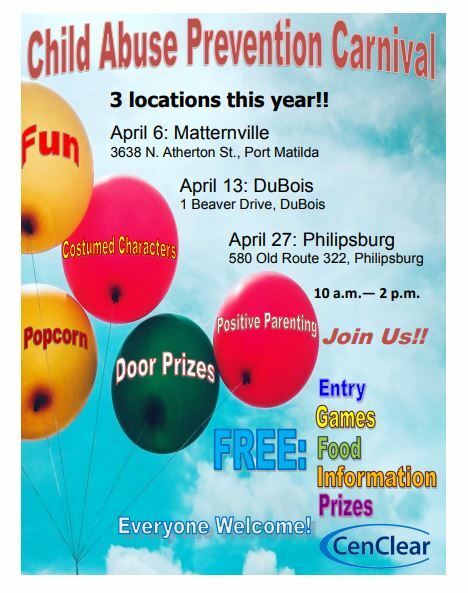 Previously, the event had been held in Philipsburg (Clearfield County), but this year it will also be held in DuBois (Clearfield County) and Port Matilda (Centre County). “By moving to three locations, we can provide more child abuse prevention information to more people and reach people in more communities,” Sean D. Rockmore, FCP preventative pre-school mental health coordinator, said. To ensure all families are able to participate, the carnival is completely free. Families can enjoy spending time together while playing games and enjoying popcorn and snow cones. Children can also meet characters straight out of their comic books and cartoons. There will also be plenty of information on positive parenting techniques and services available through area agencies. Every 10 seconds in the United States, a report of child abuse is made. Over 6 million children are involved in cases referred to child protection agencies each year, according to Childhelp. The National Child Abuse Prevention Carnival is just one way Cen-Clear and communities are working to change these statistics. Parenting is tough, and it is easy to become overwhelmed or frustrated with a child. However, learning how to handle these situations can prevent tragic outcomes. Although parenting will never be effortless, by learning effective techniques for caring for a disobedient child, parenting can become less of a struggle and more enjoyable. Knowing how to address situations as they arise can lead to a calmer, more positive environment for both the parent and the child. The carnival is held each April as part of National Child Abuse Prevention month.